What usability issue? Well if I’m a user sitting across the room at 11:23, and possibly at 4:55 and 8:05, I might find it hard to see what time it is because of the dark black lines of the artwork create a dark black background for the thin black arms of the clock. So what has this got to do with my church or charity website? Glad you asked. 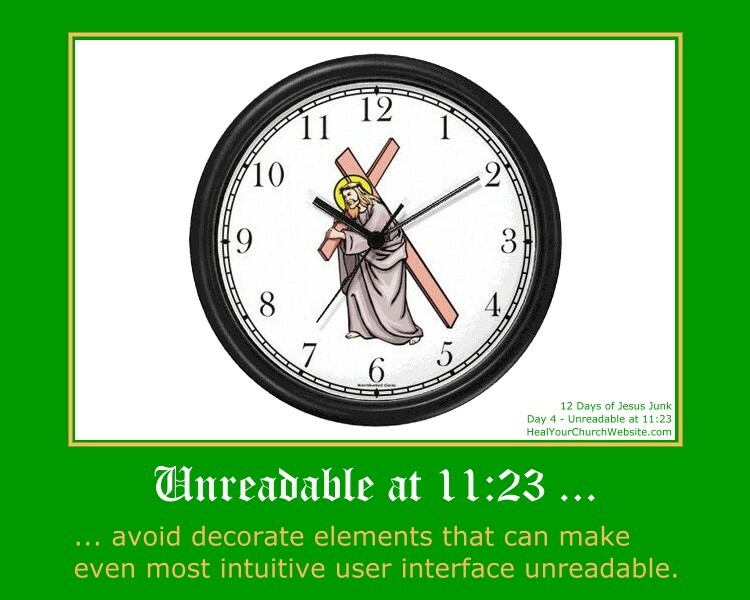 What we want to take away from today’s example is the concept that part of a successful user interface isn’t just design that looks good (not that I find the clock artwork all that inspiring) — but also a design facilitates a positive and productive user experience. This can be measured in ‘conversion rates,’ that is the rate at which the user successfully uses the website (or clock) to accomplish some item of work or information gathering. when a problem and/or encumbrance by a user is reported â€“ do what it takes to provide the user a clear path to operational/work-flow success. On that last point, think Amazon.com, the premier example of conversion goals in action. When they hear of something that gets in the userâ€™s way â€“ even if it sounds stupid â€“ they fix their site to accommodate the customer. I’d recommend doing the same, perhaps starting with some good-old-fashioned hallway testing and moving out from there.